Gun reviews: Purdey Sporter shotgun: It would be great to have enough brass to buy what we like, when we liked. But it rarely works that way, does it? I saved like mad a couple of years back for a Perazzi MX12, and very nice it is too. It?s a lovely gun to use and I have no plans to trade her in. Then again after giving Purdey?s spanking new over-under boxlock Sporter a good waggle down at West London Shooting School the other day, I?m not so sure. This fabulous gun shot like a dream, a real beauty. So now it?s just a question of scraping up enough money from somewhere or other to do the deal then. I wish. Thanks to its sublime balance and pointability this £28,750 bit of perfection managed to drive itself, which was just as well considering I turned up at the test day without my glasses. The angled 120ft tower targets were blurred but they still broke. The gun flattered me. My MX12 has great trigger pulls and handles like a peach but this Purdey hybrid, by comparison, proved to be in a league of its own. Which I suppose it should be, considering the price. Well, yes – to produce a gun of this quality at a competitive price, Britain?s most famous gunmaker decided it needed outside help to keep costs down. But not just any old helping hand. ?We needed to find a gunmaking partner who wanted to work with us, not just for us,? said Stephen Murray of Purdey. Stephen, the gun?s development manager and Richard Beaumont, company chairman found the friend they were looking for in the shape of Perugini and Visini, one of Italy?s finest gunmakers and a company noted for the quality of its over-unders. It took five years of intensive development between Purdey and P&V to get things right. Stephen and Richard ping-ponged back and forth between Heathrow and Brescia on a regular basis, and still do. For both of them, customer care and quality are top of the agenda. 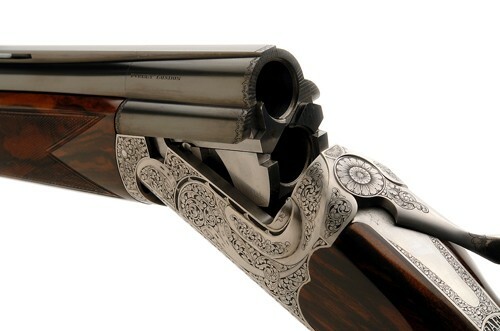 Pick up one of P&V?s own guns and you?re immediately struck by the quality of worksmanship, design and finish. However, during the long research and development programme Purdey carried out 84 separate design changes to the gun. Many are subtle and unseen (for instance a tiny change to the angle of the trigger sears) but each has gone to make an extremely good gun even better. Both are proud of the fact this is not a gun made abroad, stamped with the Purdey name, then shipped into South Audley Street for sale. Each Sporter is a creation of two famous gunmaking houses ?working with each other,? says Stephen. Purdey supplies P&V with the action body, barrel monobloc, trigger lock, dedicated Purdey-style top lever, bolt, safety thumb piece, safety slide, sugar tong spring fore-end iron, top lever bolt and safety works made on its own CNC machines in London. All the major ironwork components except lock work and tubes are made in London but Purdey let P&V joint the barrels to the monobloc because they have greater expertise in this area – a hugely important skill when it comes to getting each gun?s point of aim absolutely spot-on. P&V assemble the gun in Italy and also head up and chequer the stocks sourced by Stephen and Nigel. They shape the stock to customer measurements before being brought back to London to undergo the traditional Purdey finishing process. Purdey prefer that P&V use their greater experience in the draw bolt construction process to head up and do the important make off work. The Italians also laser cut the basic scroll engraving pattern (designed by Nigel) which is then hand finished in the London workshop. Unless fixed chokes are requested all guns are sent to Nigel Teague to be bored out and fitted with his invisible choke tubes. Once this is done the gun is submitted for superior proof at the London Proof house then returned to the finishing shop for a detailed final inspection by Stephen or Nigel. Purdey and P&V build two Sporters each month and delivery time is about six months – plenty long enough to save up the necessary wonga. Now, where did I put that piggybank? Travel case with tools and accessories: Choke key, spare triggers and return springs. Mainsprings and main spring tool, stock draw bolt key.